I need a new router to mount under a router table. Looking for ease of adjustment and bit changes along with reliability. Searches here find the Triton, Bosch 1617, Milwaukee 5616, and Porter Cables. No perfect router because there are pros and cons posted about all of them. How difficult are bit changes? Seems like most need 2 wrenches except the Triton. The Milwaukee 5616 has a loyal following with great features (but most likely not a high sales percentage). Will it raise high enough in a table to get both wrenches on it? Or do users simply take the motor out of the fixed-base with the push of the button for bit changes? The big Triton might also be an option—lots of strong reviews, but some disappointed owners also, and it looks like the switch is on the back, so the router box would need 2 doors. Push the button and the base and frame fall off with a plop giving total access without cranking. 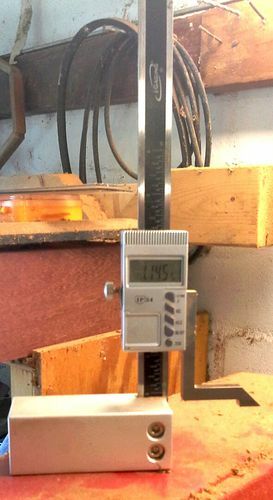 I use a digital height gauge to precisely set the bit height. You can buy a bent wrench to reach with just about any of them that have a large enough opening. I have a MW5615 for hand use and a MW5625 for the table, and love both….they’re just really stout routers with good features that perform as they should. I don’t recall using both wrenches ever being a problem, though it’s not as easy as the one handed above table bit changes with my old Freud FT1700 (no longer available). I have the PC 3hp and love it. I initially looked at the Triton last year when I got my PC and passed because of its odd shape. I moved to a lift (from using the plunge feature of my older PC) so I do not bolt to my plate anymore and needed a round router. As far as the switch location, I never use the router switch as I mounted a switch box to the front of the router bench to control power. I made mine but you can buy them just for that purpose. Hope that helps, let us know what you do. When my old model Hitachi M12V died, I did a lot of research and decided to buy the Triton 3HP mainly for the bit changing and height adjustment features. After using the router, I found both features more than met my expectations. The power and soft start features are impressive. I think using the onboard power switch on any undermount router is both inconvenient and unsafe. Therefore, I recommend an exernal switch in which case the location of the power switch doesn’t matter. Personal pref, but I purchased a predrilled insert. +1 on the bent wrench even on the Triton is helps a lot. I purchased mine from Sommerfeld Tools. I have a Triton 2 1/4 Hp in my outfeed in my table saw and a porter cable 7518 with the MLCS power lift pro they are all super routers and the Power lift pro is outstanding. I use the bosch 1617evs and really like it. I also have the table top you linked to. I just bought it an got it set up. The bosch is pretty easy to change bits with if you buy the offset wrench. As for the table top, i don lIke it. Rockler has the bosch package for 189.00, which ain’t a bad deal. If you do a lot of demanding jobs, like cope and stick door frames, then a (alleged) 3 horsepower router will be of great benefit over the less powerful tools. Lots of great info from everyone’s replies. I like the Milwaukee 5616’s simple and rugged build. Major height change and motor removal with the push of a button—but it has the 2-wrench bit change. Maybe bit changes would be easy on the Incra plate by simply pulling the plate/router out of the table, remove motor from base, change bit, then put back together. I am concerned a few people posted the fine adjuster got clogged up with dust and became hard to turn. Northern Tool has the 5616-20 with free shipping for $179. Triton is big, ugly, and people also like it, and a few people have had issues with it. I’d want to build the below-table dust collection box big enough to reach the on/off switch from the lock lever side to not need 2 access doors (Incra has pre-drilled plates, router sits at angle). Sommerfeld Tools has the 3 1/4 hp for $250 and free shipping. Highland is $250 for 3 1/4 hp and $220 for 2 1/4 hp + $13 ship. Need to think about this for a couple days. Too many good choices for us! If you have a separate on and off switch you just leave the router turned on and control it with a separate switch that’s the way most the router tables work from the many router tables I’ve used other than a beginners router table that you have to reach underneath to use. When selecting a router you also need to consider the availability of accessories and parts. 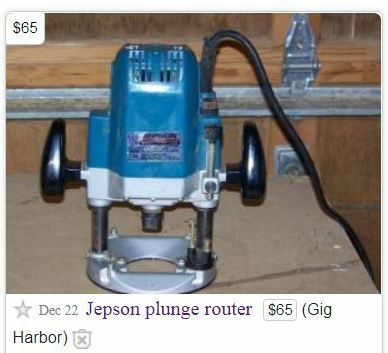 Jim, agree on separate switch for an under table router, and will either DIY, or buy one. But to get the Triton raised all the way up for above table bit changes, the switch needs to be off from what I’ve read. So we don’t access it a lot, but needs to be somewhat convenient. That’s not quite accurate”d” my Trition I raise by use of the twist knob that lowers and raises it and I believe it raises and lowers by the crank handle also. With a separate switch, the switch is all ways in the on position on the router. One option for making changing router bits easier would be to install a collet extension and leave it chucked in the router. When it is time to change a router bit, the router could be raised for easy access to the extension collet. While I have a collet extension, I have never used it. Therefore I cannot speak to its performance. There would have to be sufficient downward travel of the router mounted in the table; otherwise it may not be possible to always set the router bit (chucked in the extension collet) to the correct height. 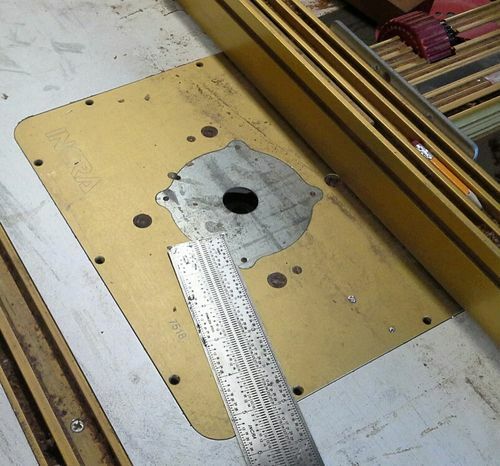 A router table whose top is hinged could provide easier eye-level bit changes. Honestly, as long as it is of decent horsepower I don’t think it matters much as it will be attached to a plate that is adjustable. Theoretically, as long as you don’t need to pull it out from under the table, other than the collett you’ll never see it so as long as it’s not defective. My Bosch 1617 is 2.25 HP and does a fine job. I’d be looking for something cheap, beefy and used off of Craigslist like a Porter Cable. You can usually find them for $50-$75 and sometimes even less for the motor only which is all you need if it’s gonna live under the table. Switch doesn’t matter as you will want a seperate paddle switch for it. Variable speed is nice but as long as it’s not a soft start model you can buy a HF variable speed controller for cheap. JMO. 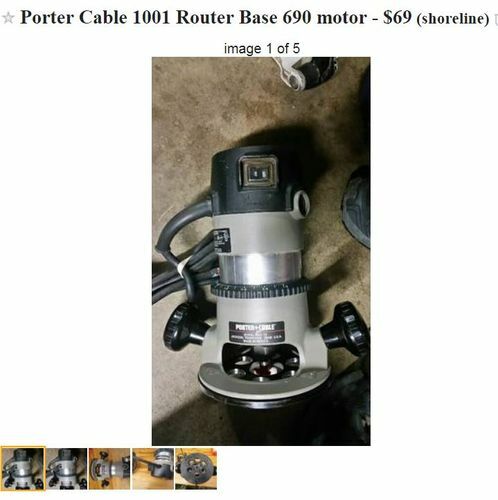 I used a Portercable 690 for years it worked fine I don’t see them for less than a $100 in my area but I live in Hicksville. Not quite sure how you make just the motor work unless you have a lift to mount it in? 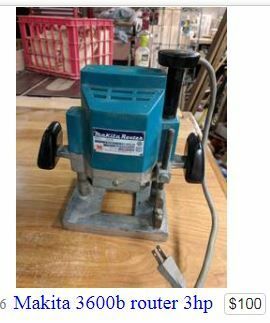 I used a Portercable 690 for years it worked fine I don t see them for less than a $100 in my area but I live in Hicksville. Not quite sure how you make just the motor work unless you have a lift to mount it in? I may have misunderstood. I thought he said he had a lift to bolt it to. An under the table router without a lift is a complete PITA. I just grabbed a PC for $60 2 weeks ago with a D handle base and the 1/2 & 1/4” colletts. Here’s another couple of examples currently listed.